Hawaii may be known for its thundering waterfalls, verdant shorelines and volcanic ridges, but some of the best things to see in this tropical destination are actually not on dry land. From coral reefs teeming with tropical life to naturally occurring turtle cleaning stations, there are a lot of reasons to get into the ocean on Oahu. 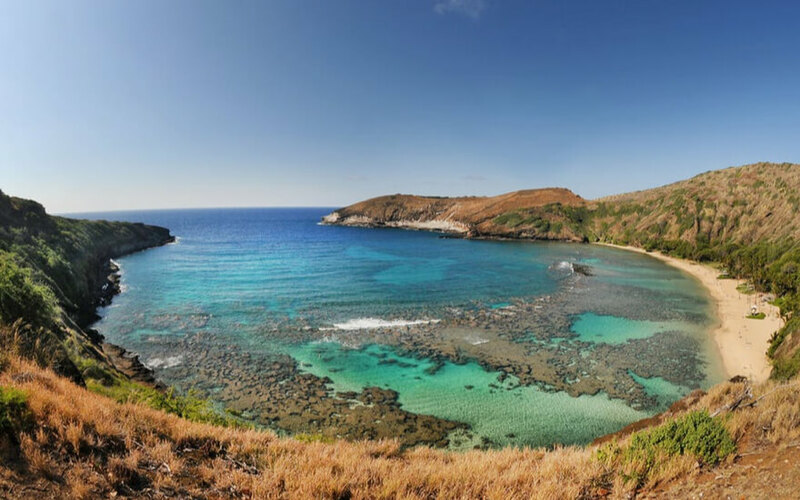 Visit Hanauma Bay, Oahu’s top snorkeling destination, take a catamaran cruise along the shore, or wade in with your own gear wherever your heart takes you. Check out these Oahu Hawaii snorkeling tours! If you only have time to go snorkeling in one place on Oahu, this is the place. Formed within a volcanic crater, Hanauma Bay is a pristine marine ecosystem, rife with bright corals, tropical fish, and green sea turtles. This park gets fairly crowded, though, and often can hit capacity before 8am! Skip the lines and packed parking with this tour package. They’ll pick you up in Waikiki and take you out to the park and all your gear rentals are included. Entry is guaranteed–though admission is not included in the price! 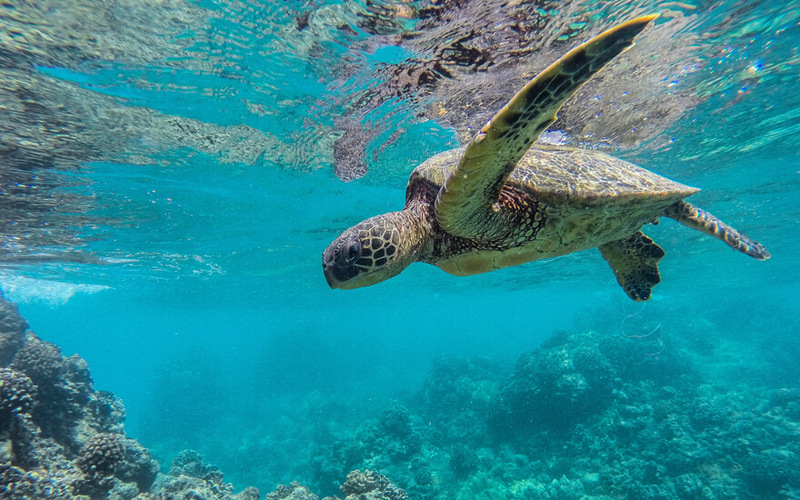 Cruising up Oahu’s western coast is sure to yield some excellent snorkeling destinations, especially if you stop off at Turtle Town, a natural turtle cleaning station where algae-eating reef fish clean the turtles’ shells. This afternoon snorkeling cruise hits the coast’s best spots, including the popular turtle spot. Between stops, enjoy the sun stretched out on the catamaran’s nets. Lunch is included! 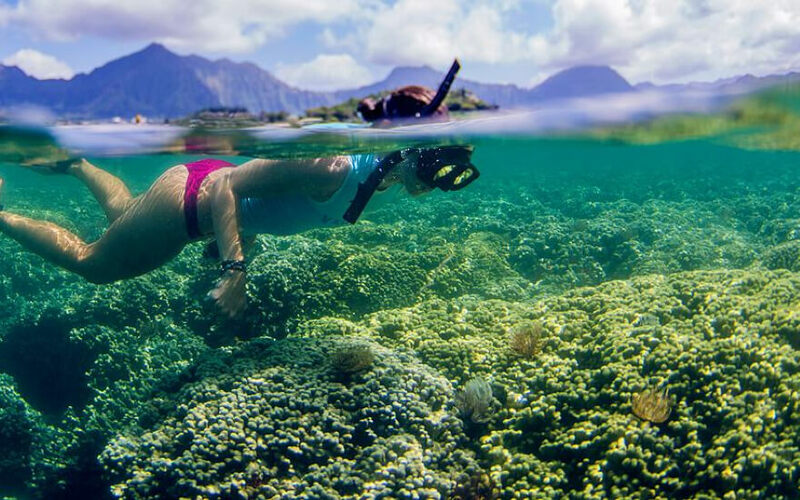 Oahu’s North Shore isn’t only famous for surfing, it’s great for snorkeling too. 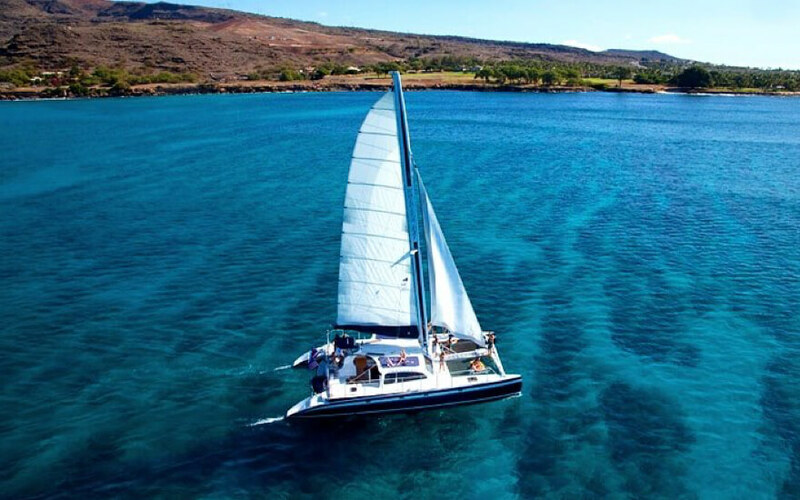 Check out this afternoon sail for excellent North Shore snorkeling. Head over to Waimea Bay and enjoy lunch and beverage after, The best thing about the North Shore? The price is always more competitive than in Waikiki. This tour is only $80 per person. 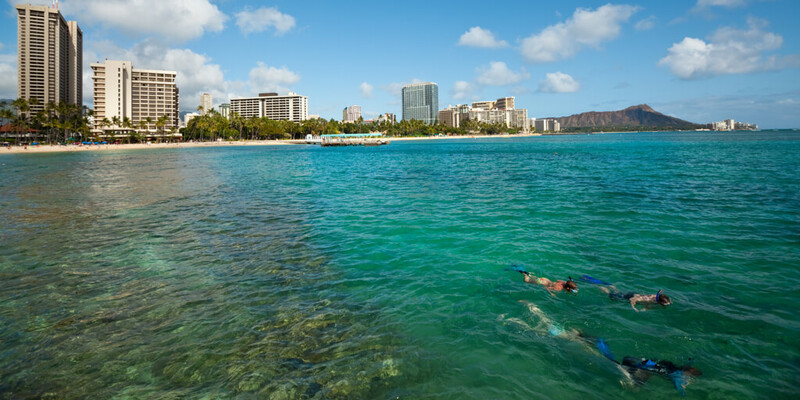 You don’t have to stray far from Honolulu for snorkeling on Oahu. Sans Souci Beach in Waikiki is only a fifteen-minute walk from the main drag and its white sand is both beautiful and inviting. Despite its proximity, Sans Souci doesn’t get as crowded as the rest of the Waikiki beaches and is in fact most often frequented by locals. Home to a flat reef and lots of fish, this is a great spot for safe, accessible snorkeling. 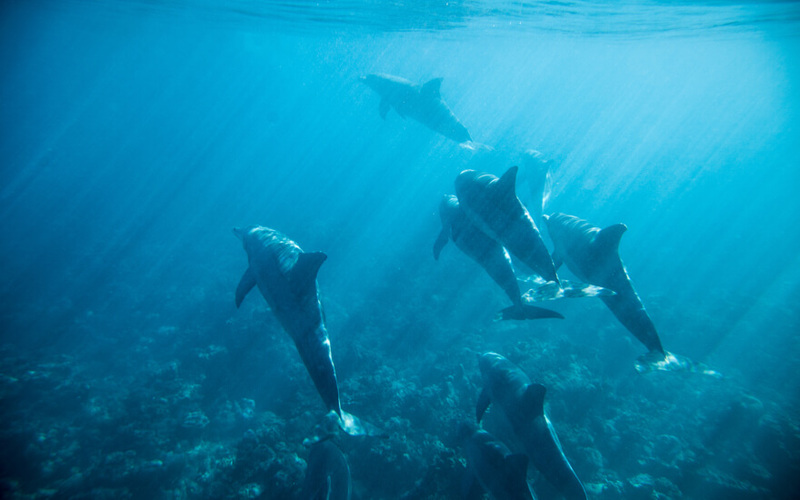 This dolphin tour is well worth the trip out to Waianae. This area is known for having the calmest and clearest waters, and it’s home to both spinner dolphins and—during the winter months—humpback whales. 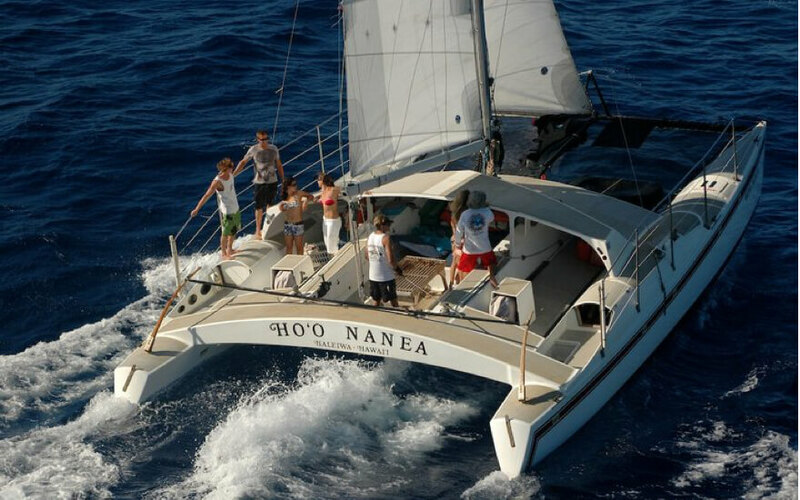 This tour starts in Waianae Boat Harbor and travels along the shore. Observe the spinners in their natural habitat before traveling to a snorkel site home to Hawaiian green sea turtles and tropical fish. Lunch is included as is round-trip transportation from Waikiki and Ko Olina hotels, if you need it. Not all snorkeling experiences are created equal. 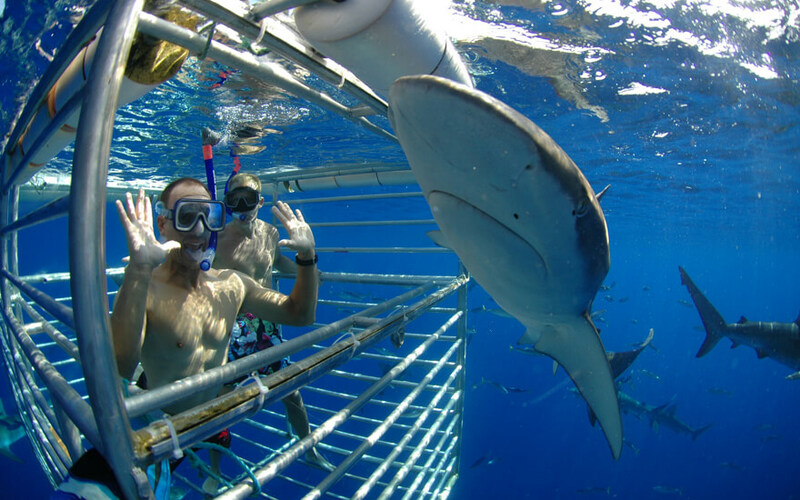 There’s snorkeling–and then there’s the shark dive. Hawaii Shark Encounters specializes in education and ecology and they love helping people to better understand these much-misunderstood aquatic creatures. Their small-group experience allows you to come face-to-face with sharks in their natural habitat in a safe and respectful way. Sharks Cove is well known as one of the best places to snorkel on the North Shore, and you don’t need to take a boat to get here. This compact bay has a rocky bottom dotted with corals creating an intricate series of nooks and crannies that sea life love to hide in. Don’t miss this spot if you’re traveling in the summer–in the winter the waves on the North Shore can get unruly. On the other side of the island from Honolulu, Kailua has a reputation of being less crowded and more relaxed, making it a very popular area for families. Kailua Beach is also known as a great snorkeling destination not too far from Honolulu. Enjoy a kayaking & snorkeling adventure with Twogood Kayaks as they guide you by kayak to Popoi’a Island. You’ll search for sea turtles and enjoy some incredible snorkeling and beach time before heading back to Waikiki. You don’t have to get out on a boat to enjoy the best snorkeling Oahu has to offer. This kayak and snorkel adventure company does great guided kayaking tours of Kaneohoe Bay, on Oahu’s windward coast, home to Oahu’s only barrier reef. Their morning tour takes you out to Coconut Island (where Gillian’s Island was filmed!) with plenty of stops to snorkel patch reefs along the way and observe sea turtles, rays, and tropical fish in their natural habitat. This one is great for kids! Looking for other great experiences in Hawaii? We created the Hijinks Hawaii Facebook Group to provide help, support, and guidance on Hawaii tours, activities, and adventures. Whether you’re an experienced Hawaii traveler, a local with insight to share, or a first-time visitor to the islands, you’ll find advice, special offers, and a community of passionate people ready to help. Join us now! Planning A Trip To Hawaii? Join our Hawaii Facebook Group for advice & discussion on the best Hawaii tours, activities, and adventures.